Pediatric Dentistry of Florida, Dr. Tim Verwest, DMD & Associates is giving away (1) one Thanksgiving turkey to 25 different families in Southwest Florida. 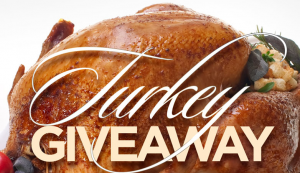 Like and share Pediatric Dentistry of Florida Facebook page and hashtag #TurkeyGiveaway for a chance to win. Winners will be selected on Tuesday, November 21, 2017. All winners will be given 24-hours to claim their turkeys. If turkeys go unclaimed another winner will be selected. One winner per family. Pediatric Dentistry of Florida, Dr. Tim Verwest, DMD & Associates continues to provide pediatric dental care to children for over 25 years. Areas of service include comprehensive dental exams, cleanings, composite fillings, dental hygiene education, extractions, fluoride treatments, sealants, sedation dentistry, space maintainers, x-rays and tooth nerve treatment. For more information, visit www.DrVerwest.com or (239) 482-2722.